Nuvol Digital – State-of-the-art Media App to drive sales of on-shelf merchandise! NUVOL supplies innovative digital solutions that allow our clients and customers to more effectively communicate with their audiences. This communication can take the form of product information that stimulates sales or customer feedback that can be analyzed to adjust messaging as needed to achieve results. The UNIQUE NUVOL approach is to be inclusive in our solution to make it possible for our clients and customers to implement leading-edge hardware/software solutions without investing resources to navigate through a myriad of possible technologies. An impossible task for the average business person focused on day-to-day business challenges and lacking the background and contacts necessary to find just the right technology solution for their business. The team at NUVOL has the experience and works diligently to stay ahead of the quickly moving technology wave. Key to our strategy is that we develop no hardware or software products internally. We are thereby free to choose from world-class products that are the right fit for our clients. Our suppliers are the best in their own disciplines having passed our strict vetting process. 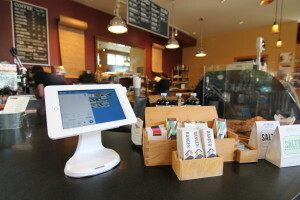 Table/Shelf mounted tablets carry the advertising and information messaging to your audience at the point of sale where it is most effective and can directly affect sales. 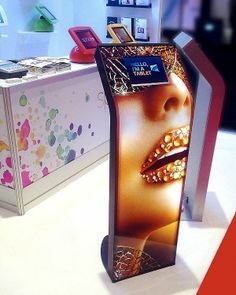 Free standing kiosks can be placed anywhere to convey key messages to your customers in an attractive package that encourages engagement and drives sales. 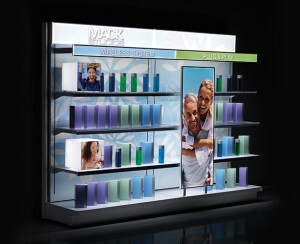 Complete shelving solutions that incorporate industry leading tech to reach customers in new and compelling ways by attracting attention to product with lighting and then informing them with product information on interactive tablets that invite the shopper in. Numerous studies have shown the efficacy of using interactive technology to help the shopper to answer product questions that can lead to buying decisions. In studio and salon environments where the challenge has been to engage the shopper with product information in a fast pace environment where available time is limited, these products can minimize the time required to drive sales of product by answering key questions the shopper may have. NUVOL makes these advanced technologies easy and affordable for all business. The unique approach we use is to offer ALL elements of the solution, from consulting to financing to integration to long-term support. We do it all. That allows our clients to remain focused on their business without having to learn complicated new skills. All done at affordable costs for any size business. NUVOL can handle single store sales – all the way to national chain rollouts. NUVOL brings together industry expertise from the key areas of Retail Management, Technology and Finance with one goal. To deliver on the challenge of increasing sales and customer engagement in new ways that control costs and allow our clients to remain focused on their business. Positioning our company ahead of the technology curve to allow us to give our clients the best possible vision of technology and industry trends. The goal of this approach is to give our clients the competitive advantage of deploying the right solutions to address business needs – while limiting risk and maximizing efficacy. COMPLETE solutions that take in to account all phases of the project. Including consulting, solutions integration, installation and long-term network management. NUVOL brings to the project decades of experience in the key areas of digital technology, retail sales and finance. The result is a uniquely accurate vision we can impart to any project. The result is a project that meets our client’s business needs, budget and allows for competitive advantage. Think of NUVOL as the general contractor building just the right solution for your business. We employ products that pass our strict vetting and are the best in the world at what they do. Who we partner with may change based on the needs of our customers and clients. We develop little ourselves so we are free to match the best solutions with what our clients really need. Therefore we are not limited to what we have developed – which may not be the best fit for our client. With NUVOL managing the project you get the best solution at the lowest cost.